The above little device looks simple huh? You may be thinking that is just a table top tripod and you don’t need an expensive one like this – and for years I agreed with that thought. 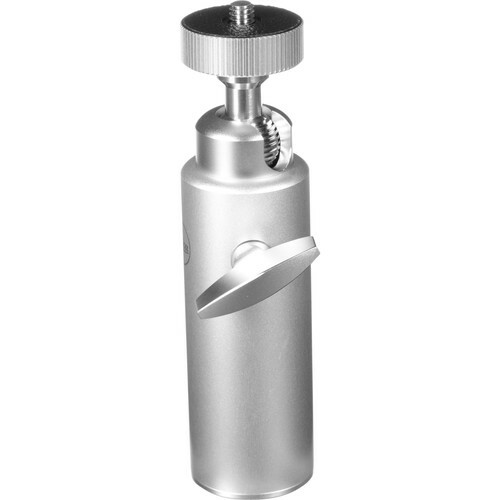 The device below is a more insanely priced ball head for the aforementioned tripod which I thought could certainly live without (or find a cheaper alternative). I’m here to confess that I was wrong and stupid for not buying these both years ago, but NOT for the reason you might think. While these make a fine combo for a tabletop tripod, I don’t need a table top tripod. I can usually find a table or garbage can or something to rest my camera on that does a perfectly fine job as a tripod. That isn’t why I use this combo – and specifically recommend THIS combo ONLY. What’s more I use it with full size DSLR’s including my Canon 1D X pro body – not small cameras (but it’s usable with them too). You mount your camera – any size – and using your hand on the camera as normal you can leverage the tripod on your chest to stabilize the camera. This has allowed me to get shots two to four stops lower than image stabilization alone (super valuable for D800/D800E shooters) which means I can use lower ISO’s. Despite his advice, it took me almost two years to bring myself to finally buy it myself. In short, it changed my life and helped me to realize how this little investment helped me a lot more than many of the $1000+ investments I made to improve my photography. The Leica Tabletop Tripod ($119) and Leica Large Ball Head ($209.95) combo are stupid expensive ($328.95), so I can understand your resistance buying them. However, I’ve not found anything else that has worked as well – and I’ve tried! The stability of this model of tripod is stronger than anything I’ve used and the ball head (the expensive part) is long enough to work well with big DSLR’s and flexible enough to let me get whatever position I need. Given the ridiculous price of this combo, almost no photographer will buy this set for themselves, but like a great set of high quality steak knives – you never regret it (or can go back) once you own it. As a result, this is the perfect gift for your photography friend! I know that I’ll get flamed for the stupid price of this pairing – I CAN RELATE. I knew about this combo for years but refused to buy it due to its insane pricing, but I can honestly say that nothing has improved the sharpness of my lower handheld shots better than this combo. If you own a Nikon D800/D800E then you will thank me after investing in this! I finally rationalized this purchase when I realized that if it is good enough for a Pulitzer prize winning photojournalist who prides himself on getting the shot with the least expensive solutions – why am I not using it? Now that I have it, I’m kicking myself for waiting so many years to do this! 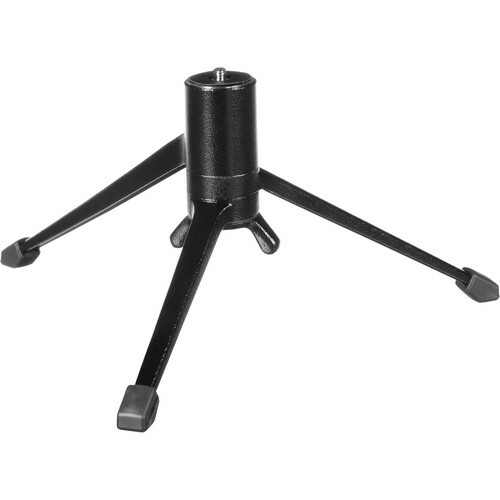 Click here to learn more or order the tripod and click here for the ball head on the B&H web site. My friends at Amazon have the tripod available here and the ball head here. How are you supposed to frame a shot in the viewfinder or LCD if the camera is pressed against your chest? I'll try to post a picture, but the camera isn't pressed against your chest - the tripod is. See the picture of Gary and imagine the camera on the top of the ballhead up to his eye. Interesting concept for not-too-steady D800 users. I imagine a Really Right Stuff BH-25 ballhead would work just as good as the Leica. I'd love to see a demonstration of this before taking the plunge. For about $18 on Amazon you can get an Ultrapod II that does the same thing (though undoubtedly not as well or as comfortably). But it is extremely light and very rigid. I've tried it with my Canon 5D3 and it is amazing how steady you can get. Great idea. Assuming you are talking about the Pedco UltraPod II Lightweight Camera Tripod, I don't think that one is going to help much with the DSLR's due to the short height of the head. I also agree that I'm not going to be super stable with those legs stabbing into my chest. Gary Parker, he is the man who invented such an tripod! As you have motivated with this, after reading your experience I am getting inspired now to check it out! Yes, Anila - Gary invented this technique and he's a photographer who I have a great respect for. 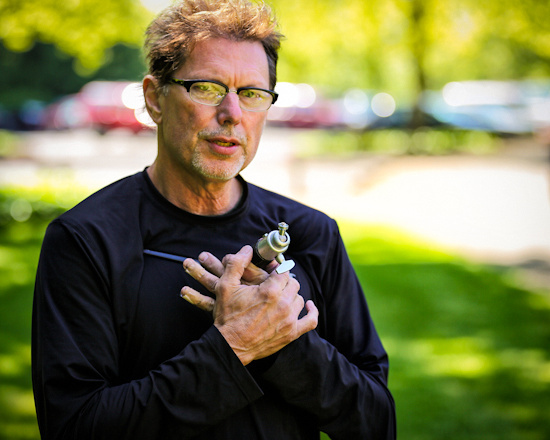 The photo of him included in the article was taken at a workshop we co-taught together here in Seattle. Bronx Prof & Tom Parker - Please check this article out again to see the video - see if that helps you understand the technique better! Thanks for the video, Ron. I ordered the tripod but use it with a Really Right Stuff BH-25 I had left over, and I find the combo works just like you said. Thanks for the great tip! Cool, thanks for the feedback Tom! That wouldn't be my choice because its shorter, but if that works for you then that's all that matters in the end. The point here is about the technique and I just share what hardware I felt does the best job for me. I suppose if you get the $175 version you have the advantage of being able to work with a AS plate on your camera, so that is a benefit - albeit a heavier one from what I can tell. I've now ordered the Leica table tripod and head. I've used the cheap and smaller Ultrapod quite a bit with my 5d3 and other smaller cameras with excellent results. The Ultrapod has to sit very high on the chest and requires scrunching neck and shoulders but it works! With successful proof of concept, I'm confident the investment in the Leica gear will be worthwhile. There are so many event or dark situations where even a monopod is not practical or is prohibited. This alternative is easy to pack, relatively stealthy, and allows the flexibility to alternatively hold the camera away from your body for high or low angle shots without removing the tripod. Thanks again for a really useful idea. Hello! I came across your blog when trying to decide if I should upgrade my 6d to a 5dMK3, or use the money for new lenses. Specifically, I am looking to purchase a 70-200mm lens. I rented one from a local shop this week and had to use a very high shutter speed even with image stabilization. Long story short, do you think it would be a worthwhile investment for a lens of that size as well? Thanks for the interesting article! Stabilization and support only help with camera shake motion blur. If your subject is moving you'll need shutter appends fast enough to freeze your subject. For example, a pro football player usually needs 1/1000 to 1/2000 to avoid motion blur, but a landscape doesn't move so 1/30 sec would be find but you'd need stabilization to avoid camera shake. Make sense? Keep the 6d & get the 70-200 - that's the smarter investment. Thank you so much! I hadn't actually considered how fast my toddler was moving at the time, I can usually catch him without a SS as fast as I was using. And yes, I am pretty sure it wasn't actually camera shake after what you said and after reviewing my pics. I will definitely take your advice. I appreciate your response! Would this combination also work if the ball head were attached to the lens foot on a super telephoto (e.g., the Canon 200-400mm lens) rather than to the mounting hole in the camera body? Or would this position the camera body too close to your head to be comfortable? I now shoot wildlife with an AF-S 80-400 since retiring from studio work. Been a bit disappointed at times with hand-held camera shake at 400mm despite VR etc. My solution was to up ISO and hence shutter speed, then I get picky about noise. BUT I just tried this technique with an unused,ball-head, table-top tripod..... OUTSTANDING! Thanks Ron and thanks Gary! Thanks for sharing your story! Like I say in the article, it's a stupid expensive option that I kick myself for not doing sooner. Some things are worth it! In fact, I rarely carry a full-size tripod now that I have this. I can get better handheld shots and I can usually find something to put this on for long exposure shots. Thanks for the excellent tip (and thanks Gary for inventing it). As soon as I read the article I had a look on Ebay. I found the latest Leica tabletop tripod and large ball head, in almost as new condition, for a good price. I doubt they are that common in the UK so it was a lucky find. I gave them a go earlier today and managed to get a very sharp shot at 1/6 of a second using a Sony A7m2 and the FE 55 1.8 lens. I've sent you a small donation in appreciation. Awesome Kevin, I'm glad it worked out for you. I'm not sure if Gary invented it but he certainly taught me about it and has been using it for 30+ years with the same Leica combo. It's expensive but it does appear to be one of those "buy it once" purchases that lasts, so getting a deal is great for you! Thanks for your support! Please share your enthusiasm for this or other favorite articles with your friends on forums and social media. Nikon and Minolta both made copies of the Leitz table tripods; they sell for very reasonable prices on ebay. As for cheap modern alternatives with problems like too sharp feet or too short a column: either condition could be cured with a few grams of mouldable plastic like Instamorph, saving several hundred dollars. Using a chest brace is a good idea, but fetishizing one particular item isn't. It reminds me of an street photography blog post about how Gary Winogrand would always check the viewfinder of his Leica for an instant before snap-shooting even though he didn't seem so. So Kim posted something like "So you should too, although if you have one of those new fangled digitals [the Ricoh GR is very devisive among street photographers] you can't." Completely missing the point was the check, not the used a Lecia viewfinder - Winogrand might have preferred an IPS screen himself if he'd ever got the chance to use one. Global photography advice! Joys of the Internet. Just came across this fantastic idea. Think it would really help mobility on safari, shooting from one side of the vehicle and another. Before I use your links to purchase required elements and get imported into UK I'm wondering how it would work on a set up with a telephoto zoom arca-Swiss lens foot . I'm using a nikon d7200 with the 200-500mm lens. Could you use the set up attached to the camera and just support the lens with your hand perhaps? I'm guessing it would get pretty heavy after a while! Or would it be better to connect direct to the A-S foot and if so would the Leica ball head need an additional connector? I haven't tried this configuration with a full ball head, but in theory it would work but I wouldn't recommend it. The 200-500mm is a bit big for this setup, so I'd advise using a monopod with it instead - you'll get the stability you need and much better maneuverability for safari action shooting. I recommend using the configuration as shown with a direct mount to the camera and for a lens bigger than a 70-200 then I'd definitely go with a monopod. I started using a Nikon clone of the Leica in the mid-1980s for interior architectural shots. My preferred method for using it as a brace for handheld work, though, has been to fold the legs so the unit can be used like a gunstock, held against the shoulder.